likes a butterfly or fairy on our creations, I hope she lets the little moth by the cats knee pass. Hmmm, today looks like a break the rules day, all in fun. 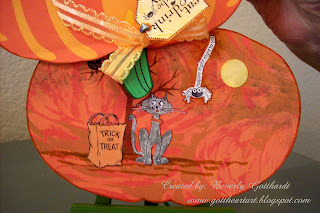 Supplies: Card Shape: Printmaster 11, background paper: Printmaster 11, ribbon and orange cord: Hobby Lobby, small heart brad, Ink: Ranger Archival Ink-Jet Black, Sepia, CTMH-Z2125 Grey Wool, Z2123 Goldrush, Stampin Up marker-dusty durango, CTMH markers-brown bag, grey flannel, white daisy, topiary, Small Circle punch, Stamps: My Sentiments Exactly-Q704, Stampin Up-Eat,Drink, and Be Scary, Stampendous-SSC039 Window Box Set, Hero Arts-C3939 Kitty, Stampscapes Cloud-018E. How cool is that! I love halloween! This is so fun! Neat to see something "out of season". Of course your little moth can flutter by...it's all in fun anyway!! Thanks for playing along with my Flutter By challenge! 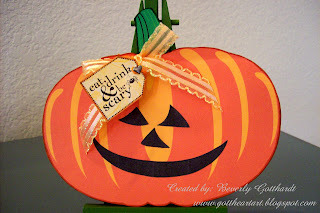 Love your shaped pumpkin card. I need to get started on Halloween cards myself. Thanks for the reminder! What a great idea - really fun. 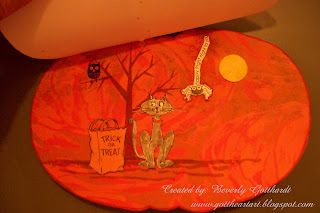 Great halloween card, I love the pumpkin shape. Thanks for joining us at SSC. What a fantastic shapetacular card Beverly. Love the Pumkin shape and love the scene inside. Very cute. I love the scene inside. That is SOOOO CUTE!! I love it!! What a cute shaped card!! Love the inside too. Great job on using all the orange :D Thanks for joining us this week and hope to see you back soon! Totally cute card, love it. Thanks for playing along with us at PIO this week!! Perfect way to use mostly orange! hehe cute card! Too fun!! And what a great idea to make a pumpkin for mostly orange!! Thanks for playing with us at Pile It On! Your card is too cute!! Love the pumpkin shape. Thanks for playing along with us at TPE!! Terrific card!!! Somebody is going to love receiving this. Fun!!! Thanks for joining us at TPE! !